Private-label mortgage backed securities are securitized mortgages that do not conform to the criteria set by the Government Sponsored Enterprises Freddie Mac, Fannie Mae and Ginnie Mae. The mortgages that make up these securities do not have the backing of the government and as a result carry a significantly greater risk. 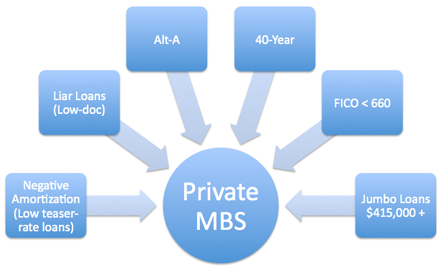 Below is a diagram that represents the types of mortgages that would not classify as GSE conforming loans. Many the mortgages that made up private-label mortgage backed securities were ‘Jumbo Loans’ with a loan amount of more than $415,000. During the housing bubble build-up, housing prices were inflating and as the average home price increased more and more loans became non-conforming Jumbo Loans. Without the government insurance, private-label mortgage backed securities relied on credit rating agencies to inspire confidence in investors that the debt was safe. Debt holders relied on credit rating agencies such as Moody's, Standard & Poor's, and Fitch to prescribe the amount of risk associated with private label securities. These private label securities earned great ratings from the credit agencies. In fact, the vast majority of private label debt was rated AAA, the highest rating achievable, second only to debt that was government insured (Gorton 25). The appeal to investors was a higher return as to the comparable government insured securities. So what was the problem? The ratings weren’t accurate for a number of important reasons. Many of the models that were used to ascertain the riskiness of these mortgage back securities used a method known as “independent observations”. The models assumed that each observed change in an underlying asset would not affect any other asset. This turned out to be a terrible assumption because as people began defaulting placed downward pressure on overall home prices. These ratings looked very appealing with the higher rate of return and many people invested with confidence in the credit rating agencies marks, frequently in individual retirement accounts and pension funds (Adrian & Shin 11). When the bubble eventually collapsed and debt issuers were unable to make good on their securities, investors absorbed the brute impact of the firm failures. 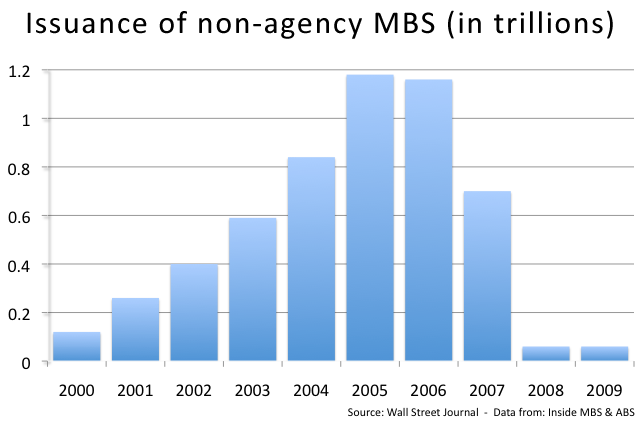 Below is a chart that shows the rise and fall of private-label mortgage backed securities.